Are you someone who loves cats? Over the past few weeks, I have been having quite a bit of fun taking care of kittens. One of our local feral cats chose our home as the perfect place for her babies and it has been a wonderful stress relief for me. To my surprise, so many people didn’t know I had a soft spot for cats! Growing up, my family and my husband’s family both had cats (my inlaws still have cats, including my old lady Lucie, who refuses to leave my inlaws. My silly girl refused to come home after a trip and at 14, we let her have her way! While she is an old lady, she still loves to play, especially with any toys that contain catnip! While I was at BLogPaws, I had a chance to actually see some of the new Jackson Galaxy toys, which I have to admit, were pretty cool! 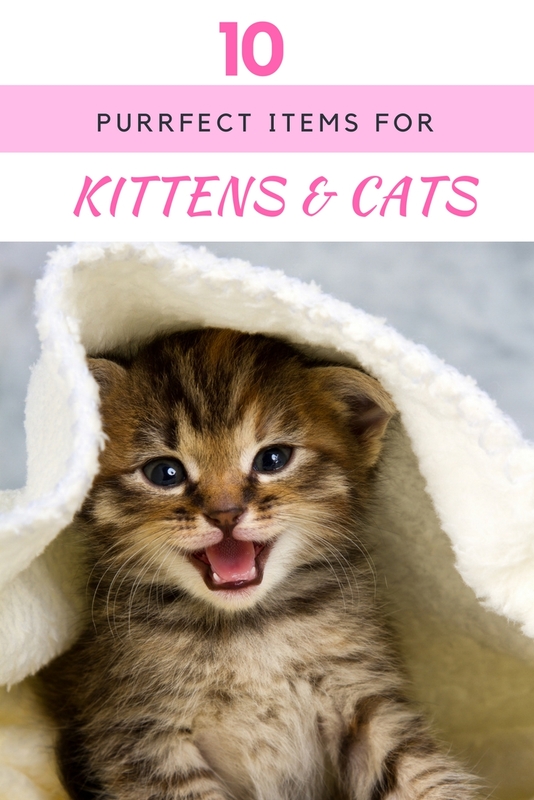 Knowing that so many of my friends, family, and readers are getting new kitties, we couldn’t wait to share with you our favorite, must have items for both cats and kittens. Make sure to tell us what you think of these 10 purrfect items for any cat and kitten household below! Keep your cat engaged in playtime with the ever-changing Jackson Galaxy® Asteroid Puzzle Treat Toy! Insert your cat’s favorite treat, and then give it to him or her for endless amounts of fun. As your cat learns how to get the treats out, you can push in the nubs to increase difficulty making it more challenging for treats to come out. Great for training or keeping cats busy! Trying to find the perfect ball for kitties who love to hunt? 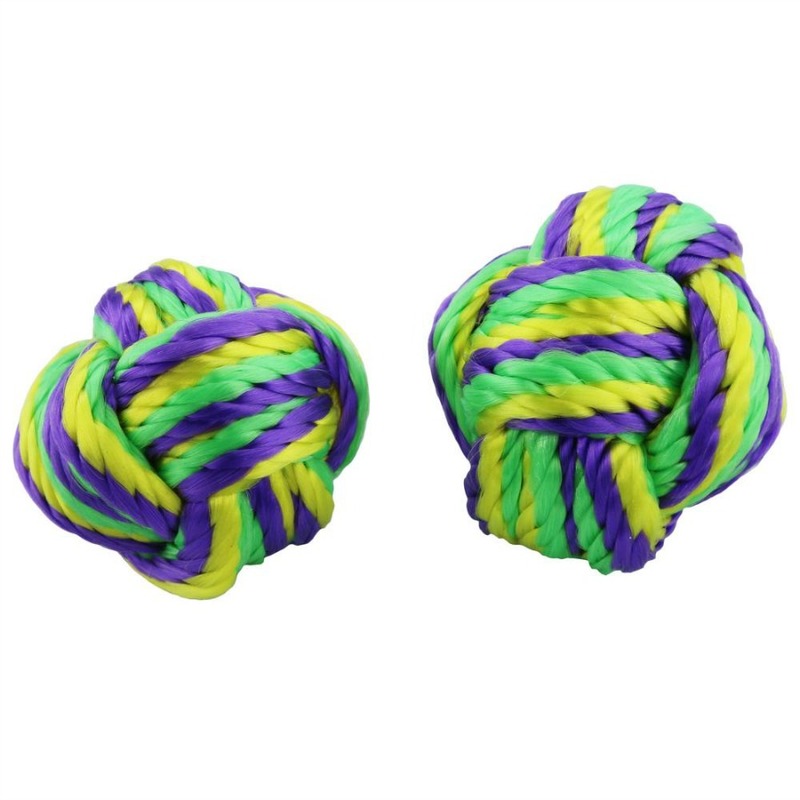 These durable, brightly colored cat toys are made of polypropylene rope and are irregularly shaped for unpredictable movement that ignites raw cat play! Pet owners can choose between catnip infused Puma Paws or Puma Paws that do not have catnip. Did you know there are puzzle toys for cats too!? The Jackson Galaxy® Go Fish Puzzle Toy is a 2-in-1 cat toy and feeding bowl that utilizes your cat’s natural hunting instincts for an entertaining feeding time! The fish tails can be rotated easily, rearranged, or removed for a continuously changing puzzle. If your cat is a fast eater, you can place their food in the spaces between the fish tails to make the toy a slow feeder and slow down eating and aid digestion. Best of all, everything is washable and encourages your cats natural hunting instincts! Does your cat love catnip? Infuse your cats toys with catnip with the Jackson Galaxy Vault Marinater. This fun device uses a unique marinating technique and confines loose catnip between permeable walls, keeping your cat’s toys clean from debris. It works with official Jackson Galaxy Toys and most materials such as fabric, rubber, plastic, sisal, and more! Jackson Galaxy Organic catnip sold separately. Help your pet enjoy playtime with Jackson Galaxy® Marinater toys. These toys are made of natural materials (cotton, rope, and corn husk) to ensure safe playtime for your cat. As well, these toys are perfect for any Jackson Galaxy Marinater, which helps give these natural toys a catnip scent! Toys come in a variety of sizes and designs to fit your cats needs. 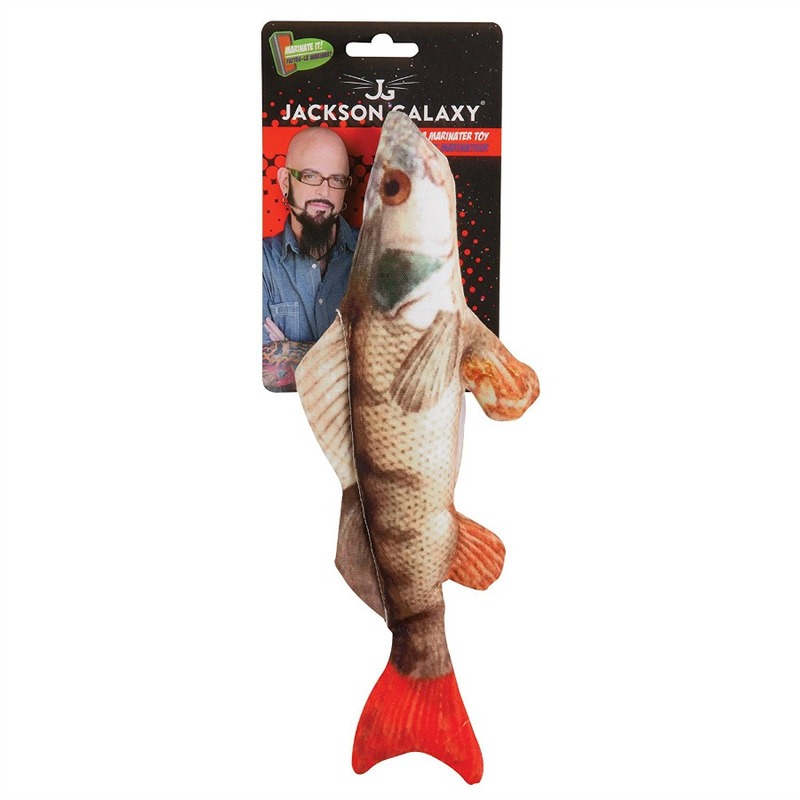 These are the large varieties of the Jackson Galaxy Marinater Toys. Just put these all natural toys, made from cotton, rope, or corn husky into any of the Jackson Galaxy Marinaters to give them a natural catnip scent that will drive cats wild! Have an indecisive kitty who doesn’t know where they prefer to sleep? The Jackson Galaxy Comfy Clamshell Bed clinches up into a cozy cuddler or lays flat for cats to stretch out, allowing pet parents to make their kitty comfortable on their demands. As well, it is versatile by having a soft plush inside and durable polyester outside that is easily reversible. 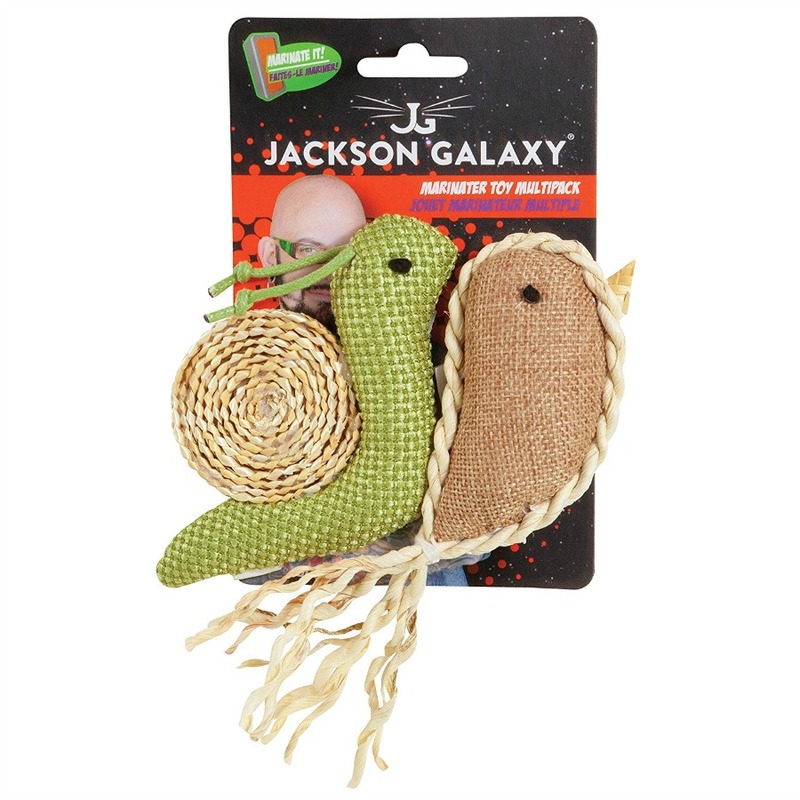 If you are looking for a cute toy to keep your cat active and entertained, we are sure you will love the Jackson Galaxy® Space Station! This cute and exciting toy has multiple openings so that your cat can hunt the ball from inside or outside the elevated Space Station bowl. 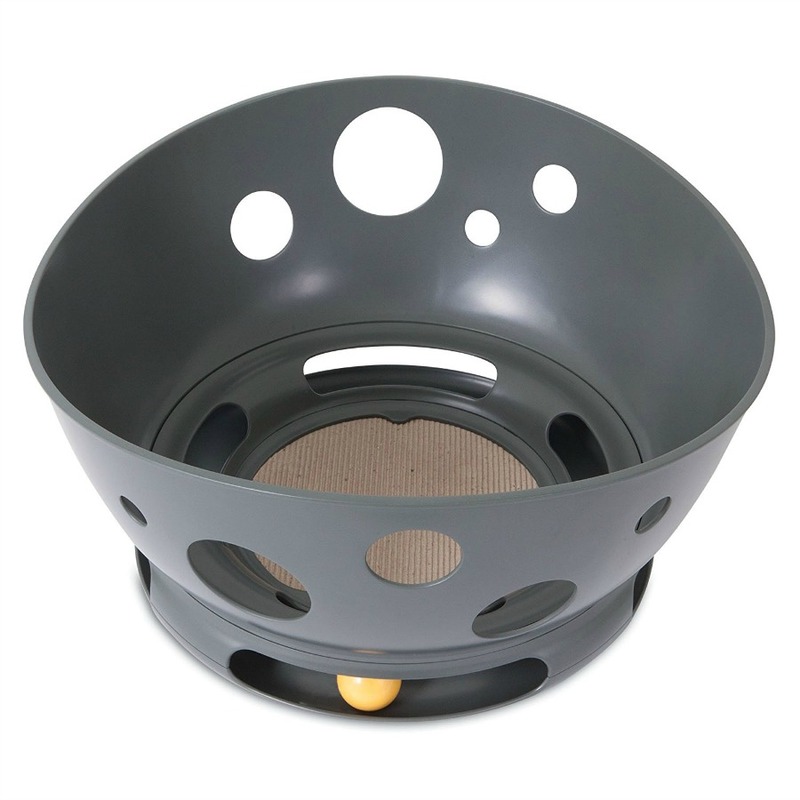 The deep, high-walled bowl features a replaceable scratch pad on the bottom and is deep enough to allow your cat to stalk, pounce, and play. Best of all, it is great for single or multi-cat households, making it a great choice for cat parents! 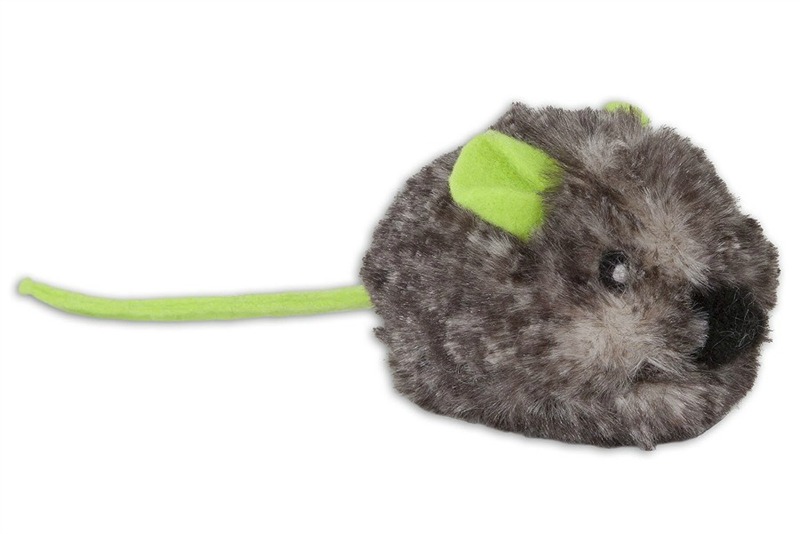 Jackson Galaxy Motor Mouse is a fun and innovative cat toy that cats love because it is as unpredictable as your kitty. This cat toy provides hours of fun for your cat, all you have to do is give his tail a gentle tug to start the fun! The unpredictable movement, vibration and catnip center will entertain and keep your cat busy for hours! Do you have multiple cats in your household? Make life easier with a Petmate Giant Litter Pan. 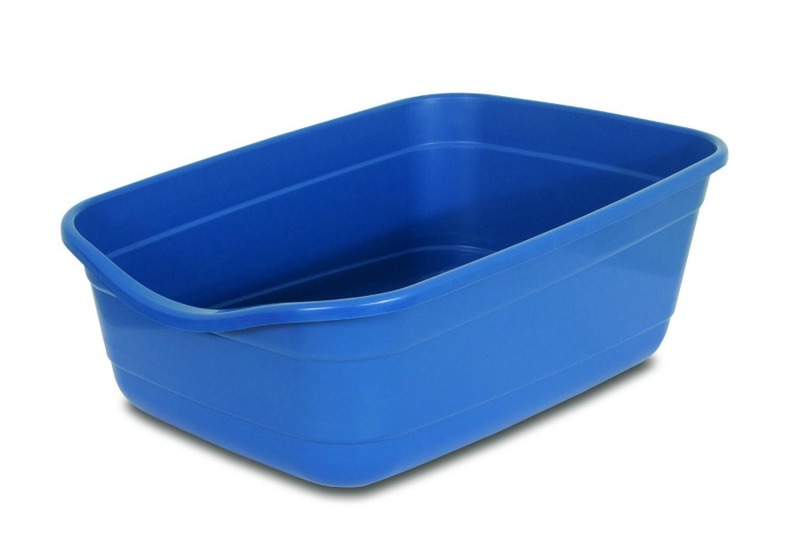 With the litter pans large size and walls, scatter and waste easily stays in the litter box. This litter box can hold up to 30 lbs of litter, allowing you to spend more time with your cats. Aww, that is so unselfish of you to let your cat stay with your in laws, definitely thinking o her best interests rather than your own. I have the Jackson Galleries fishing pole type toy and my cat loves it. I have owned three cats and I know they enjoy these. Their favorites are strings and they jump high! My three cats would love everything. I especially like the fish. Looks so real! Great roundup! I have never seen most of these. The Marinater looks like it would be a lot of fun. I love to give them catnip toys and then sit back and watch the show! My cats are both over 9 but they still love their toys and like to play. They love catnip so any of the toys with catnip would be wonderful. These reAlly are perfect toys and goodies for cats,they’d love them. Super cute toys and other items for kitties. My cat love to play with her furry mouse. It has catnip inside and she just loves it. My cats would love the Jackson Galaxy Comfy Clamshell Bed. One of my cats would sleep in the Jackson Galaxy Space Station. Thanks for the review. We actually have a few of these products and they are great. I think our cats would love any and all of these. The Space Station Toy looks like several of them could play at the same time. I love the puzzle toy. I know my cats would enjoy figuring it out and playing with it!!!! These are some great products! We need the giant litter pan for our cat because he kicks the litter out of the pan. These are some great suggestions. The motor mouse would probably be the one mine prefers. I love everything on this list. My girls love playing a version of the arcade game “Whack A Mole” that I made for them just using a cardboard box and cutting the holes in the top. I love to watch them try to figure out which hole the mouse is gonna come out of next. Keeps them entertained and is a fun way for me to enjoy interacting with them. All of these toys are amazing, I love his show and he really knows cats. 🙂 Our kitty would definitely enjoy all of these! The Comfy Clamshell Bed is such a brilliant design too. The big fish cat toy is awesome! My kitty would LOVE that!! I think my cat would love that bed. She likes to crawl up into small spaces. But the feeder looks great too. All of these products looks so nice! My cats love their deep cat litter pans and it keeps the cat litter kicked out to a minimum. I’d get them cat beds but they prefer sleeping in mine. As for toys, they love little balls & toy mice to play with. These products look fun. I’d love the clamshell bed. I love the treat toy – I may have to buy one for all people with cats that I know. I love the Clamshell Bed and the Jackson Galaxy Go Fish Puzzle Toy & Feed Bowl! I like that you can put food between the pieces because our cats eat so fast, they sometimes puke it up! This would definitely help slow them down! So many awesome cat things! I love the clamshell bed! And that snail toy is adorable and just weird enough that I have to have it. The marinator is now a must-have for us. My Daughter just adopted two kittens who also have a big Brother now. I’m going to share this link with her. I am loving the Jackson Galaxy Go Fish Puzzle Toy & Feed Bowl for my own fur babies. I have a senior kitty and I think he would love the Jackson Galaxy Comfy Clamshell Bed. Those are some super cute toys! I enjoy watching My Cat from Hell. Jackson is so good with cats, he amazes me. My cat, Cleo would enjoy any of these toys, especially with catnip. I love the Vault Marinater! What an awesome idea for toys that have lost their nip! No need to throw them out and replace them. My cats love the Jackson Galaxy wand toys. I think they would like the Jackson Galaxy Puma Paw too. All of these are awesome! Love the giant litter pan. Our cats would love that puzzle toy. They are always so intrigued by projects we are working on. I can almost hear their little brains trying to figure out how humans do some things. This would be great for them to figure out. The giant motor mouse is so cute! My cats love chasing their toy mice, and I think they might love this too! My oldest cat would love the clamshell bed. Maybe she would move off my bed pillow. The two youngest love to chase the balls around tracks so would love the Space Ship toy. OMG…the The Vault Marinater sounds wonderful! We are constantly having to vacuum up loose catnip! I have rescued several cats in my time. The latest was going to be put down by the man who owned the property she showed up on just because she had an injured leg. I rescued her, took her to the vet, and a year later, she has one less leg, but she is happy and healthy as can be. I’m sure she would love some of the goodies on your list. I have 2 cats, one is older and doesn’t really play too much. The younger male is just a year old now so he’s always playing or INTO something. I just got some new toys for them that look like “springs” but not made of metal. Kiki would love the Jackson Galaxy Puma Paw, the Jackson Galaxy Go Fish Puzzle Toy & Feed Bowl and the Jackson Galaxy Marinater Multipack Toys because she loves anything with twine or rope. She would also have a cozy time in the bed! I just love the Clamshell Bed. Lois, my kitty, would love it. She likes to be snuggled in tight. These are some really great ideas for my cats. They are so playful and love getting new toys to stimulate them. Looks like a wonderful variety of items that any cat would be lucky to have! I think my favorite is, the Jackson Galaxy Go Fish Puzzle Toy & Feed Bowl. Our adult cat loves to play Since moving into a house with tile floors in the Living room we have made it her playroom. She owns two Jackson Galaxy toys and they appear to be her favorite. Thanks for the review. My cat would love all of these. Thank you for the review. We don’t have any cats but our son does. I definitely got some great ideas here. And the price is great on all of the items, so this is good for me. My cat loves her catnip toys! We have learned that our cat hides her cat nip toys and then acts like she wants more – so who’s the smart one? I know she would like a couple of those cool toys. I like to see her get excise. I have to say, I love Jackson Galaxy. I love that he is a big star now! Hmm I love to put together gift baskets, you could make one up with the litter box as the basket and get a bunch of these – it would be fun and well appreciated! Great looking items many cat owners will enjoy. My cat would love the to play with the Puma Paws. The Clamshell Bed looks cozy. I love that Clamshell Bed! My cat likes the bed to curl up on the sides like that so he can really snuggle. All great items, thank you for the suggestions! It surely has some amazing item’s to which the cat will find excatly (exactly) like what I wanted for them! 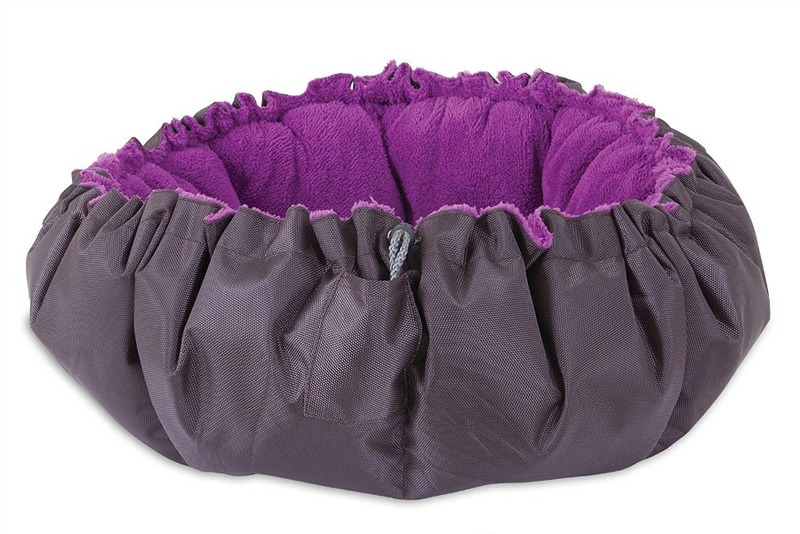 This has a list of some great choices from the Jackson Galaxy The Vault Marinater /-\ to /-\ Jackson Galaxy Comfy Clamshell Bed! 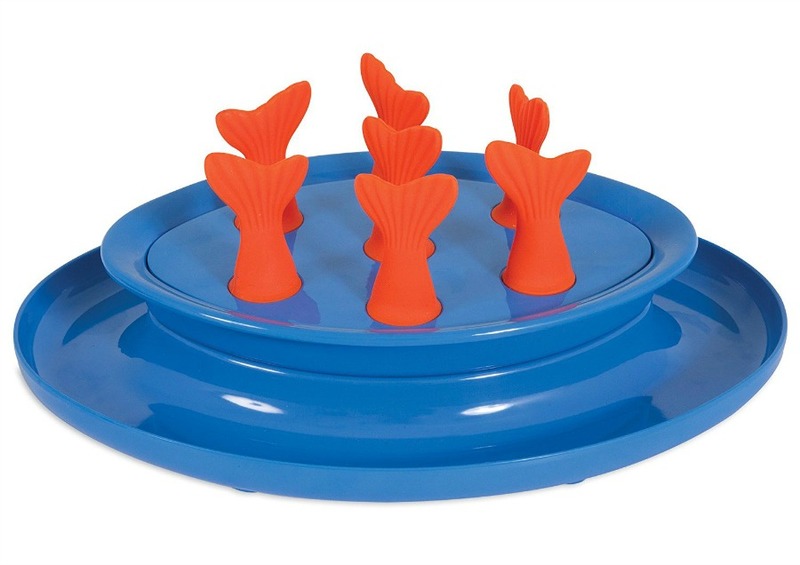 The Jackson Galaxy Go Fish Puzzle Toy & Feed Bowl looks like so much fun. This would be awesome. I know my cats would love the clamshell bed, and our two kittens would enjoy the space station. I’m curious how well they would like the puzzle treat toy. Some of my older ones might enjoy that. I had no idea that this company made so many cool toys. My cats would absolutely love each and every one of those toys. My cat is extremely fussy when it comes to toys. I try to get him things to keep him active but he’s gets bored so easily. I think I’m going to try the motor mouse. That clamshell bed it something I know my cat would like. She likes burrowing. I LOVE THE SPACE STATION TOY. Some crazy fun toys to keep kitties occupied. Thank you for the review. They have some cute toys for cats. My sisters cat would love all of these products. I will tell her to read this post. I will have to share this with my good friend who just adopted two new kittens. Very cute items, thank you for sharing. Oh my!! These are all too fun!! I will have to let the grandmas know about these fun toys they can spoil their babies with! Loving the fish bowl toy and feeder!! I love the Jackson Galaxy Comfy Clamshell Bed – it is different than the usual and looks so inviting!